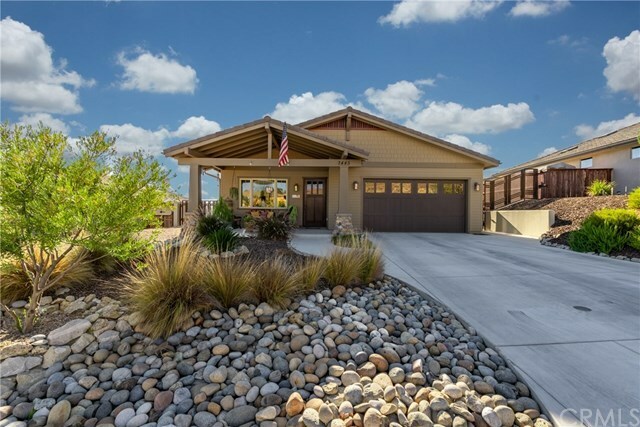 Modern Craftsman home in the highly desirable Lakeside Village at Lake Nacimiento. Oversize tandem garage with maple cabinets & plenty of room to house your lake toys. All the elegant details you would desire from: beautiful engineered hardwood floors,10ft ceilings, 8ft solid doors,tall baseboards, cased & trimmed windows,built in cabinets with tall pillars,wood burning fireplace, granite counters throughout, kitchen cab soft close,stainless steel appliances, on demand hot water plus energy efficient lighting. Luxurious master bath and gorgeous jack & jill bath.Prior to your entry is covered porch, drought tolerant landscape with 2 custom fences. The backyard is incomparable to others with it's impeccable design for entertaining with ~2500 sf of patio space plumbed with household water and propane. Elegant built in stainless steel kitchen with bbq, sink and pizza oven. Upper patio with plumbed fire pit and gorgeous views. Drought resistant landscape with iron fencing & stucco walls. Spa is perfect year around makes great dunk pool in heat. Gated community offers:24 hr ranch patrol,2 swim pools,sport courts, launch ramp/marina,trails,equestrian center,library,fire department,campgrounds with fish station, miles of trails. Prior to gates: WALK TO 2 restaurants, veterinary, doctors office, PK-8 school,gym, physical therapist, gas station with self wash and full size grocery store. Minutes to Vineyards and town. Directions: West from town on Nacimeinto Lake Rd, Rt on G-14 (approx 10m front town). Lft on Heritage Loop Rd thru N-gate . Rt on Lakeside Village, LFT on Catalina will be on Left.